Welcome to a new era in managing processes. XeP3 is a cloud based, patented, productivity improvement toolset to analyse process activities, including the usually undocumented interfacing activities. It is ideal for improving complex processes, widespread process reengineering and change management programs. XeP3 is applicable to all sizes of organisations. XeP3 provides people in multiple teams in a company with the knowledge, skills and tools to rapidly document in a collaborative manner existing end-to-end business processes, identify ways to improve business performance – productivity and customer service – and scenario model future business processes within or across divisions while promoting cross unit/divisional understanding and knowledge sharing. XeP3 provides members of different functional teams either within the same company or across different companies and industries with the knowledge, skills and tools to rapidly diagnosis their performance in a collaborative manner and identify ways to improve their team’s performance – productivity and/or – customer service – while becoming further engaged in their business and forming a network of people facing similar challenges. XeP3 enables a company wide continuous improvement culture to be quickly fostered and entrenched by providing all employees with a common understanding, approach, nomenclature and corporate tool for driving business performance at an individual, team, division and corporate level aligned with the company’s strategy and goals. Promptly identifying productivity opportunities. For most organisations, an easy 15 per cent productivity gain in the people-related elements of transaction costs is waiting to be realised through interface activity noise elimination, quickly and without serious calls on capital. This can be achieved at the same time as raising customer service and employee satisfaction and freeing time to focus on developing the business. 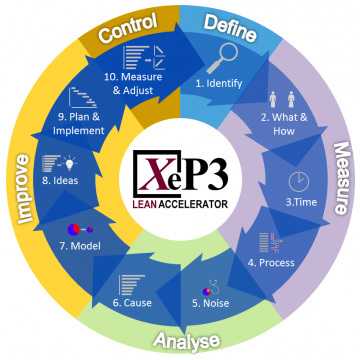 Further details regarding the XeP3 Lean Accelerator can be found here.